Davis, Graeme. 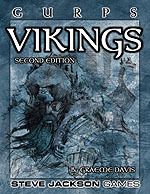 GURPS Vikings (1st ed. ), Steve Jackson Games. Dr. Who #158: The Curse of Fenric. Written by Ian Briggs. Jackson, Steve. GURPS Magic, Steve Jackson Games. Masters, Phil (compiler). GURPS Who's Who 1, Steve Jackson Games. McCubbin, Chris W. & Sean Punch. GURPS Fantasy Folk, Steve Jackson Games. Trolls based on ogres and goblins; various elves. Shiftworld soundtrack Vol.3. Track 3: Emoton, Värttinä. Song of mineral replenishment as troll motivation.